MYOB has recognised Kilimanjaro Consulting the only recognised Diamond Partner. 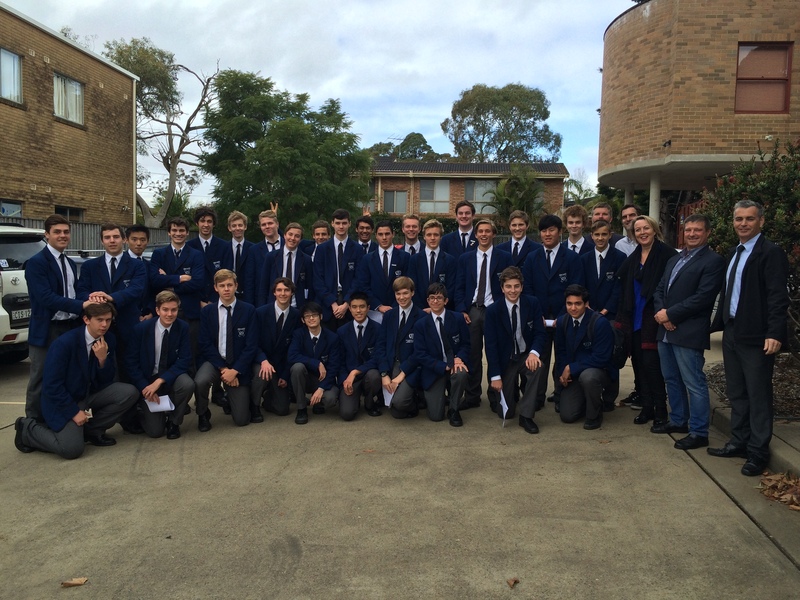 Creative Instore Solutions (CIS) continued the now annual event of showcasing the business of design to the next up and coming industrial designers by today hosting over 30 Year 11 students from Knox Grammar School. Providing a tour of the Sydney Head Office facilities and showing the students the business side of industrial design, including everything from concept creation to financial management. This years’ tour, which continued annual tradition can serve to guide students interested in laying the foundation for a future in the design industry. The CIS employees from all departments look forward to the students visit from the on site interaction to the submission of the final assessments and photography of the prototypes weeks later. Fine Wine Partners (FWP) enlisted Creative Instore Solutions (CIS) to raise the bar on the wine gifting category in store taking the guess work out of “what wine to pick” for the consumer. Leveraging their range of domestic and international brands, such as Croser and Bollinger and the extensive range of correlating gifting items was a key driver for the resulting merchandisability of the CIS designed display. FWP wanted a luxurious, premium unit in creating a sense of ” the gift itself is the reason to believe”, specifically capturing key holiday periods that lend themselves to gifting including Valentines day, Mother’s Day, Father’s Day, Christmas & NYE. Keeping with the brand portfolio, FWP required a highlight on sophistication with the key deliverable of the display to drive uplift in sales and visibility for the gifting occasion. The design asthenic centred around understanding that liquor retail environments would be motivated to maximise on counter location, if the result had a premium look and was durable in construction and ensured retailer uplift. The lightweight but sturdy display stand is easy to assemble, comes flat-packed all whilst being easy to shop with maximum gift visibility. Additionally, the viability of being able to re-dress the display by brand or occasion maximises long term ROI for Fine Wine Partners across their portfolios. “The design was capable of communicating one story across the FWP portfolio, in addition to securing in store presence by being flexible across channels with the ability to transform and re-brand by season ensuring the brief objectives were achieved” said Deane Hubball, Group CEO, Creative Instore Solutions. 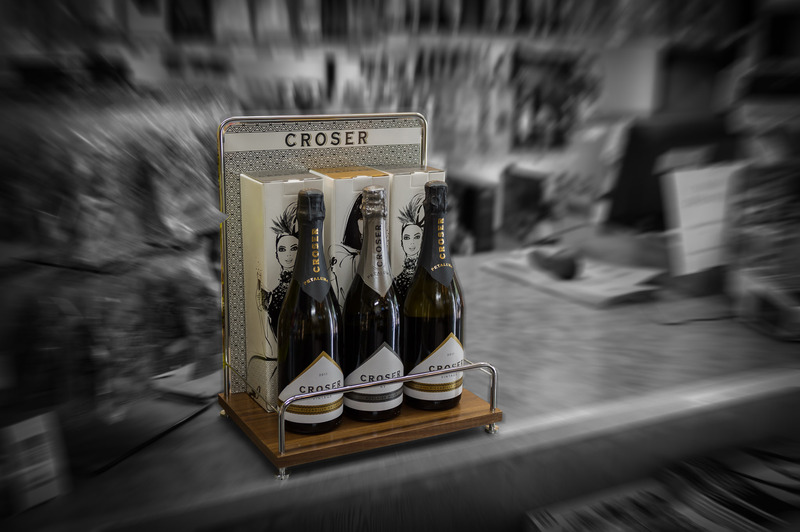 Amanda Goddard, Activation Manager, Fine Wine Partners agreed “Creative Instore Solutions hit the mark on our brief creating a luxurious, premium unit to showcase both our domestic and international brands in the gifting category”. The unit has been rolled out in Dan Murphy’s and Independent Liquor retailers nationally. 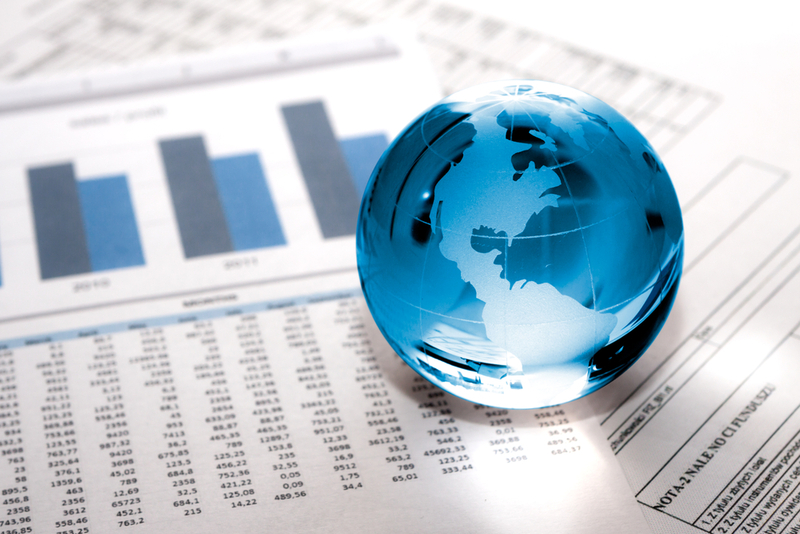 Fine Wine Partners have dedicated sales teams based in every State and Territory in Australia. They specialise in servicing on premise consumption restaurants and venues and national and independently owned retail outlets. They are fully owned by Lion Nathan and the head office is based in Sydney. “By creating a free standing mobile floor stand display unit (FSDU) with the ability to rebadge for different brands across the Asahi portfolio CIS have ensured critical value add for our customer through their activation cycle” said Deane Hubball, Group CEO, Creative Instore Solutions. 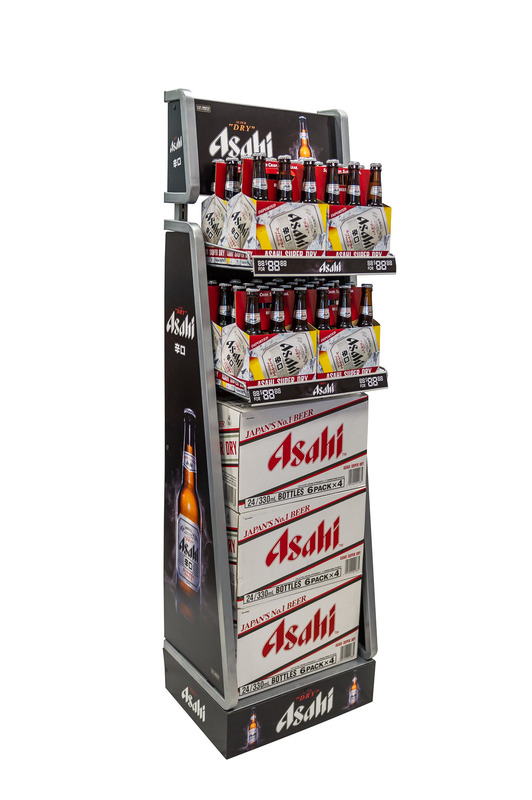 “Quite simply our independents and sales reps love the stand” concurred Matt Arnott, Trade Marketing Manager – Independents, Asahi Premium Beverages. The first run of the unit has been rolled out across 250 independent stores nationally. PepsiCo Australia & New Zealand (ANZ) has launched a Mexican Fiesta in independent supermarkets. 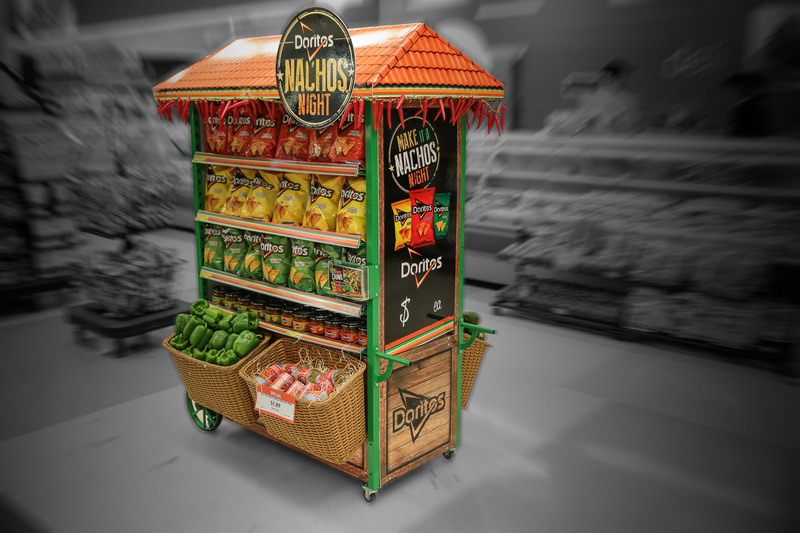 To support this program, Creative Instore Solutions (CIS) designed an iconic point of purchase cart that invokes the culture of Mexico while showcasing the Doritos brand. The off location placement of the Doritos product in the fresh food aisle is designed to create an occasion around a big night i.e. in Nacho Night occasion for shoppers. It allows the rack to generate impulse sales with associated fresh food products such as avocados and tomatoes leveraging the Mexican fiesta theme whilst showcasing Doritos as the hero product. The aim for the Doritos brand was to create an occasion in store, based on shopper insights around the impulse nature of snacks linking to social sharing occasions. This, when coupled with the popularity of Mexican cuisine, lead to the development of the Mexican Fiesta concept. The key for the display was to engage the shopper and create a true meal solution with all adjacency products within arm’s reach to increase the retailer’s basket size. 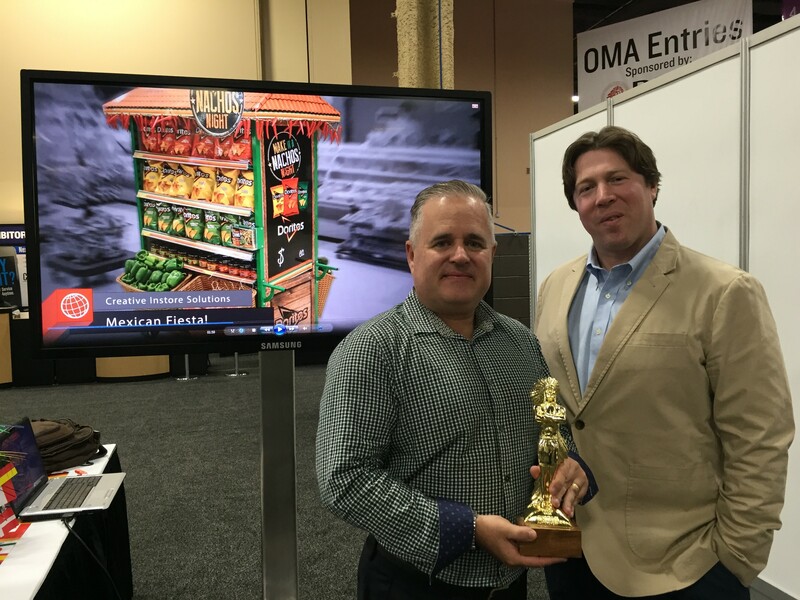 The success of the Doritos Cart was emphasised winning GOLD at the recent POPAI ANZ Marketing at Retail Awards 2014 in the Short Run Category. The display was designed for maximum flexibility in both shopper communication, range of adjacency products and ticketing. This allowed for different price points to be reflected from the display and the ability to create a bundled price offer for the shopper. This was clearly aided by the in store display that inspired shoppers to create the taste of Mexico at home, stopping busy consumers in their tracks. By commanding the attention of the shopper in the off premise fresh food aisle of the independent retailer, cutting through clutter based on the iconic food cart design and driving retailer fresh food uplift the cart design is a true point of purchase success story. Kellogg’s in conjunction with Creative Instore Solutions (CIS) have produced a point of sale display showcasing the consumer ‘To Go’ snacking option and providing an iconic option for retailers. The striking unit creates high Kellogg’s brand visibility utilising show stopping Kellogg’s Red to cut through the retail clutter. The polished clear sides both protect the Kellogg’s product whilst ensuring high visibility for the consumer. CIS understand that engaging customers and unlocking growth opportunities in retailers across the UK was the key driver for Kellogg’s and the design led approach focused on achieving this result for the client. 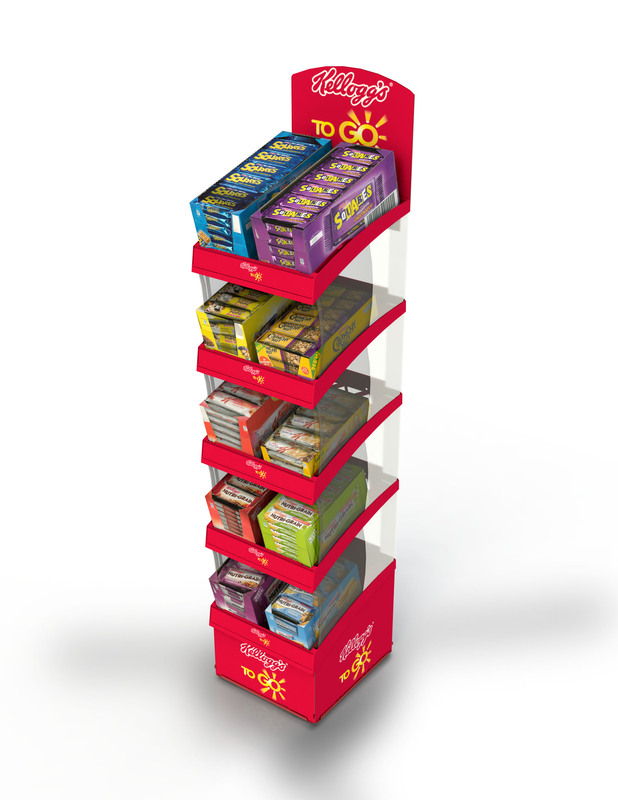 The stand is a perfect fit within the store environment and sized to fit well with associated off premise locations which remind consumers about the snacking occasion. The display unit has been designed to hold shelf ready packaging which makes stock replenishment much easier for store staff and merchandisers, removing the need to decant product. CIS and Kellogg’s also ensured the long-term return on investment by forming adaptability based on the modular design which can be varied in height, hang off a wall or placed as a single cell on a counter. Additionally, all graphics are updatable safeguarding the brand and promotional strategic changes can be made with minimal effort. Speed of assembly is guaranteed due to minimal parts with the unit being flat packed for merchandising and transportation ease. CIS pride themselves on designing and delivering truly iconic point of sale displays for customers to ensure their brands stand out in the cluttered retail environment. The display can be seen in over 3000 high street stores across the UK.